The Palestinian Prisoners’ Society (PPS) has reported that Israeli soldiers abducted, on Tuesday at dawn, eight Palestinians, including siblings, after invading and ransacking their homes, in the West Bank governorates of Tulkarem, Salfit and Bethlehem. The Tulkarem office of the PPS, in northern West Bank, said the soldiers invaded and searched many homes in the governorate, and abducted four Palestinians, identified as Amro Mohammad Ghanem, 19, from Shweika area, Durgham Allariya from Ektaba area, in addition to Ahmad Mohammad Hamdan and Omar Khaled Lifdawi, 20, from Tulkarem city. In addition, the soldiers invaded Qarawat Bani Hassan village, west of Salfit, in central west Bank, searched homes and abducted Abdul-Rahman Mer’ey, 20. The soldiers also invaded homes in ‘Azzoun town, east of Qalqilia, and assaulted a Palestinian woman, while searching her home and asking her about her son. The woman, identified as Mohammad Radwan, who is also a mother of a political prisoner, suffered cuts and bruises, and was rushed to a hospital in Qalqilia. In related news, the dozens of soldiers invaded ‘Aida refugee camp, north of Bethlehem, before storming and ransacking many homes, and abducted seven Palestinians, including siblings. The abducted Palestinians have been identified as Abdullah Hammad, and his brothers Ali and Mahmoud, in addition to Ammar Abu ‘Aker, and his brother Majdi, in addition to Adham Abu Rweis, and Mahmoud ‘Ayed Abu ‘Aker. The soldiers also fired many gas bombs and concussion grenades at many youngsters, who hurled stones at them. 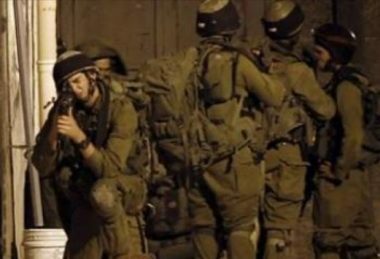 Also at dawn, the soldiers abducted two Palestinians during violent military searches of homes, and summoned four Palestinians for interrogation, in Hebron governorate, in the southern part of the occupied West Bank.